You don't need to read the long hagiography of Nina Kotova in the booklet to work out that she can play. Her performances here demonstrate her abilities amply. They also reveal some limitations. Kotova's approach to each of the suites is broadly similar. She favours long legato phrasing and a deliberate pace. Although she gets a lovely warm sound out of the Du Pré Stradivarius cello, the emotional temperature is cool. This style of playing suits the more introspective moments and movements of the suites. The second and fifth suites are convincing, though the menuets of the former and the final gigue of the latter could be more lively. The sarabandes of both the second and fifth suites are quite effective in their brooding spaciousness, though I prefer the deeper emotional engagement of Tortelier, Rostropovich and Isserlis. In fact, the sarabandes of the first, fourth and sixth suites are generally fairly satisfying. The sarabande of the third, however, tends to bloat and the allemandes of the first, third and fourth suites feel pulled about and rhythmically slack. The deliberate pacing generally weighs down the dancing courantes and where the Kotova does adopt a faster clip, such as in the courante of the fourth suite, her runs sound jarringly jagged. I don't get any sense of that personal communion with the music from Kotova's performances, flowing and graceful as they may be in the main. There is so much more to this music. Quite apart from the disappointing performances, I am not overfond of the recording itself. Heard over speakers it fills the room with a warm and immediate presence. Heard over earphones the perspective is flattened and a little close. This is not a recording for your iPod. 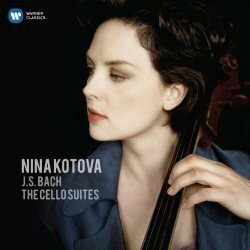 As well as the laudatory profile of Ms Kotova, the booklet recycles Peter Avis's obscure note from the 2000 EMI Double Forte re-release of Heinrich Schiff's vigorous set of the Bach cello suites. Scant information about the recording itself is provided. If you don't really listen to them — if you play them in the background while you read or iron — these performances sound fine. However, they are in no way distinctive enough to stick in the memory or repay repeated listening.